At Fairwind Stables, we specialize in training horses and riders for the discipline of eventing. In eventing, horse and rider must complete the three phases of dressage, cross country, and stadium jumping. Horse and rider must be well-rounded and have a good foundation of basics to do well in all three phases. Our training philosophy is a patient, results-oriented approach that starts with a strong understanding of those basics. Horses and riders are treated as individuals and develop at different rates. We have horses and riders that are strictly dressage riders or may come to Fairwind Stables just to establish better skills over fences. 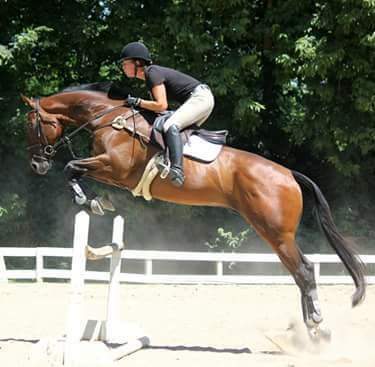 Amanda has trained horses from starting under saddle up through the preliminary level of eventing with a specialty in giving green and young horses a confident, correct start. Her students have competed successfully through the Training Level in eventing and many of them are adult-amateurs who balance a career and family life with a desire to be competitive with their horse. Find out more by visiting the individual pages for training, lessons and coaching, and satisfied customers. If you are interested in any of our services, we encourage you to contact Amanda to set up a time to watch a lesson or a training ride.